Pop quiz time: this 6'4" professional athlete is an idol to millions while still being a good father for his kids. He's got his own clothing line, his own shoes, and more product endorsements than God. He's been called the greatest man to ever play his sport, and is known for flying high through the air. More than 11 million Americans are actively involved in skateboarding alone (making it the sixth largest participant sport), and more than one million kids pick up a board each year. Add to that BMX, street luge, in-line skating, wake board, snowboarding, snowmobiling and Moto X, and you've got the devotion of an entire new school of sports fans. Athletes that aim for the X Games instead of the Olympics, and would rather score tickets to the Boom Boom HuckJam than the Super Bowl. Marketing to that crowd is a good choice. Art Asylum prides itself on being a bit more wild than its competitors, so seeking out some "alternative" properties made sense. They've given us rock icons, classic tv and the coolest movies. Now they've gone big with the best man ever to step on a skateboard, Tony Hawk. Skateboarding legend and inventor of over 85 tricks including the elusive 900 (2½ mid-air rotations). Holds the most impressive contest record in all of skateboarding; placed first or second in nearly every contest he entered and earned 12 consecutive world championship titles. That right there is pretty damn impressive. In a day when Jordan's knees are too old to play, Hawk is still pushing himself further. Only five years younger than MJ, Tony has been putting himself through just as much abuse as His Airness for nearly as long; the only difference is that the Hawk can still fly. Extreme sports originated as much more pedestrian activities. The roller rink is the direct ancestor of the skate park, and mountain biking's lineage is clear. Originally individual recreational activities, the freedom (and potential dangers) appealed to a certain mindset, and so were embraced by alternative culture. As tricks were developed and demonstrated for friends, competition (both personal and sanctioned) sprang up. In 1995, ESPN collected all these competitions in the first Extreme Games (shortened to "X Games" the next year), giving extreme sports a national platform. Art Asylum has released several types of Tony Hawk figures: 3" Minimates, a 12" line, and the 5" Vert Series. The Vert Series features three figures: the smiling Aerialist, the terrified Slam Master, and the fairly indifferent 5-0. The main difference, besides the RealScanned faces, seem to be the color of his clothes - red shirt, blue shirt... other blue shirt. Variety! The packaging for the Vert Series is nice. It's a fairly square blister, with just an angled Hawk's head logo across the top. The figures first appeared at Wal*Mart stores nationwide with a $10 pricetag, which was far too much for a toy like this. When asked about the prices, Art Asylum reassured fans that they had no control over retail prices; more reasonable prices were later found at other outlets. 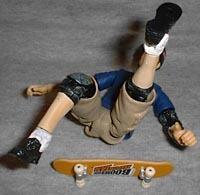 Tony has two holes in his feet but, for no clear reason, Art Asylum didn't put any corresponding pegs on the included skateboard. They didn't even give him magnets, like the Tech Deck Dudes line of toys. There's no way to keep Hawk on his skateboard, or to keep it against his feet during a jump. This would have been a minor additition to the figure, but its value would have been immesurable. The board is 2" long and half an inch wide, and features real rolling wheels. The bottom is painted with a logo for the Boom Boom HuckJam. In fact, these figures feature all the appropriate logos: "The 5-0" wears a Quicksilver shirt and has TGE, Quicksilver and official Hawk logos on his helmet. Tony, still being a good role model, is wearing all the necessary safety equipment, including elbow and knee pads. The main body of Tony's shirt, as well as his pantlegs, are made from soft rubber to aid poseability. In a nod to AA's eye for detail, he's even sporting his wedding band. 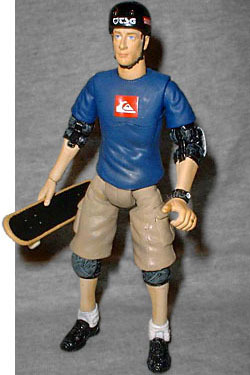 Tony Hawk is a cool guy, and I was really looking forward to these figures. While the poseability and the sculpt are there, the lack of connection to his board is really a deal-breaker. 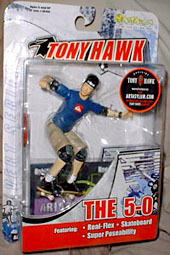 Tony Hawk may have four top-selling video games, but he'll have to wait a little while longer for great toys. This could have been a ToY contender, but now it's just disappointing.